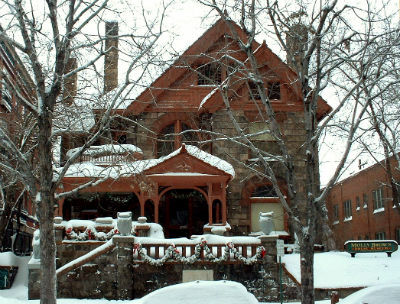 Recently, a few Bridge English students went on an excursion to the Molly Brown House here in Denver. This was meant to be an opportunity for them to break out of the typical day-to-day classroom routine and instead engage in English language learning through a real-life cultural experience. It is not uncommon for Bridge English students and their teachers to venture out into the city and participate in various tours, visit museums, or see the sights Denver has to offer. Dubbed “Lifestyle Learning”, this is a field activity that effectively takes the classroom away from the textbooks and grammar lessons, to the real world where students can apply functional language. We were a group of six with an even ratio of teachers to students. When we arrived for our tour a bit early, the students had the opportunity to make observations about the historic Denver neighborhood that hailed from the late 19th to early 20th century. When our tour guide greeted us on the front porch of the Molly Brown House, she immediately began to rattle off an in-depth introduction to Molly Brown, the house, the Titanic of which she was a survivor, and so on. My first reaction to her expeditious and complex spiel was one of concern. I feared that my students would have too much difficulty in understanding her. Then, I remembered the reason for which we came: to provide a raw language experience in which the students could apply skills learned in the classroom. Lo and behold, the students understood far better than I expected which, naturally, pleased me as a language teacher. Accompanied by our astute tour guide, and having cast aside any teacher worries, we proceeded to make our way through the house room by room. Throughout each portion of the tour, we learned about the various aspects of Molly Brown, who was actually known as Margaret Brown in her day. We were invited time and time again to ask questions and the students displayed no reservations in actively seeking further information. Again, to see them using applied English was a showcase of the desired result of us teachers here in the General English Program at Bridge. esl-blog, Extracurricular Activities activities, English students, excursions. permalink.